The 130km (80miles) trip up The Sunshine Coast starts from Langdale, the first ferry terminus and goes to the Lund, the northern end of Highway 101. Along the journey are two very different ferry crossings, beautiful inlets, deep fjords, sandy beaches and stunning forests. Summers are sunny and dry, winters mild and wet. This region receives about 2,400 hours of sunshine a year with just 94 cm (37 in.) of rain. To reach the Sunshine Coast, take the ferry from Horseshoe Bay across the Howe Sound to Langdale. Overlooking the Shoal Harbour and the Howe Sound is Gibsons. With pleasant walks, restaurants and shopping, Gibsons is a relaxing town to spend some time. Focusing on the Sunshine Coast's natural and First Nations history, this museum is located at 716 Winn Road. 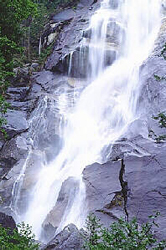 7km (4miles) west of Gibsons, off of Highway 101 along the scenic Lower Roberts Creek Road is Roberts Creek. There are plenty of bed-and-breakfasts in this peaceful area. This is a good place to look for mussels, oysters and sea stars at low tide. This "place of shelter from the sea" is 21km (13miles) north of Gibsons on Highway 101. 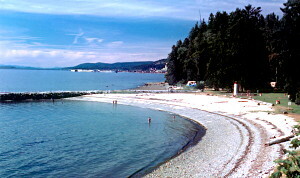 Situated on a sandbar with the Straits of Georgia to the south and the Sechelt Inlet to the north, this village is the base for the Sechelt People. After nearly being wiped out by small pox in the 1860's the Sechelt Nation is thriving now. Visit Snickett Park and Pebble Beach for good swimming, salmon fishing, cruising and scuba diving. House of Hewhiwus (House of Chiefs): A museum, the Raven's Cry Theatre, the Sechelt Indian Government Administration Office and the South Campus of Capilano Community College are located here. Rockwood Lodge Gardens: This restored 1936 building is surrounded by gardens. 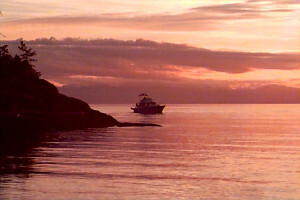 From Sechelt as you head north along the coast line, you'll go by. As you travel towards Pender Harbour the highway starts to wind and climb. As you enter Pender Harbour, the ocean view and small islands offer a spectacular view. make up the communities in the harbour. From here you can take a side trip to Egmont and Skookumchuck Narrows. As the tides move through the narrows they form rapids that roar. 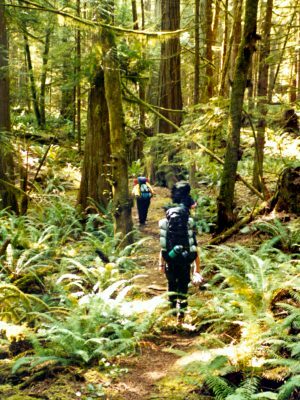 The 45-minute hike is well worth your time and effort. Continuing north along the coast line you will pass by Porpoise Bay Provincial Park, Sargeant Bay Provincial Park, Halfmoon Bay Lookout, and Halfmoon Bay. Upon entering Pender Harbour you will find the communities of Madeira Park, Irvines Landing and Garden Bay. Back on Highway 101 you will continue onto Earl's Cove. From here are BC Ferries to Saltery Bay and Powell River. 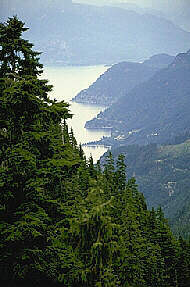 31km (19miles) north of Saltery Bay is Powell River, the largest community between West Vancouver and Prince Rupert. Scuba diving is a well known sport in Powell River, with 20 major dive sites, clear waters and abundant sea life. There are a number of historic commercial buildings and many Victoria-style homes throughout the area. With the 3rd largest photo archives in BC, the museum is located on Highway 101 across from Willingdon Beach. Beginning at Lois Lake, over 80 km (50 miles) of portages and streams connect 12 lakes.